Diving into Cake Flour 101 – A fun visual guide to cake flour including what it is, how to substitute, and side-by-side comparisons so you can see how it works in action! Before this cake flour experiment, and before the next couple of posts you’ll see here, it had been a while since I had done baking experimenting and side-by-side comparisons like this. They’re a LOT of work, but I really missed having fun in the kitchen in this way! Don’t get me wrong, sometimes it pains me to intentionally make batches of anything that I know aren’t going to come out exactly right, but the photos I’m able to create are so valuable. They actually show you how different ingredients and techniques impact your favorite treats. And I don’t know about you, but I’m such a visual person that the best way I can learn about the magic and science of baking is by seeing it in action. If you like these kinds of posts and find them helpful, then you’ll LOVE The Magic of Baking online course + community I recently created. It dives deep into baking science in a fun, visual, & approachable way so you can enter the kitchen with complete confidence. I made every effort to replicate each batch as perfectly as possible, using the same exact tools and ingredients whenever applicable. I used a kitchen scale to measure ingredients to ensure 100% accuracy and used an oven thermometer to gauge exact baking temperatures. Each batch was baked for exactly 20 minutes. I used Bleached Gold Medal All-Purpose Flour for the control batch and DIY cake flour, and Sofasilk Cake Flour for that batch. Lastly, I baked the batches in my Wilton Cupcake Pan, using a large spring loaded OXO scoop to fill each cavity evenly with batter. Also note that the photos I took in comparing these are a little darker than I would normally like, but I wanted to avoid excess post editing so you could see the color and texture as true-to-life as they were when I baked them! This lower level of protein discourages gluten formation. Lower levels of gluten equal more softness and tenderness in a baked good. Think of something that has a really high level of protein like steak. It’s tough and chewy. When we want the opposite of that texture, we want lower levels of protein. Cake flour is actually made from soft winter wheat and is extra finely ground, giving it a softer, finer and more delicate texture. That fineness is actually why cake flour should be sifted before use, it’s more likely to clump together. Lastly, cake flour is typically bleached, which further weakens the proteins which again prohibits gluten formation. Bleached flours in general soak up more water and produce thicker batters. Those three elements make cake flour very different than all-purpose flour in terms of it affects the chemistry of a recipe. Since it’s made from a different wheat using different manufacturing techniques, it’s impossible to recreate cake flour exactly at home using “DIY” substitutions. That’s why I was so eager to compare side-by-side cake flour vs. all-purpose flour vs. DIY cake flour. I had a suspicion of how this experiment would turn out, but I wanted to be 100% sure either way. I know many of us don’t always have cake flour in our pantries so it’s kind of an annoying ingredient when you see it called for in a recipe! 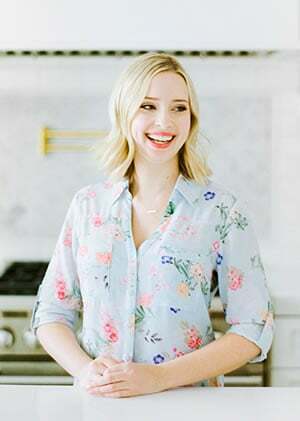 Yet because of all of the baking experiments I’ve done in my Ultimate Guides, I know one small seemingly insignificant change can have significant results in baking. The cupcakes I baked were based off a standard cupcake recipe found at the bottom of this post. This recipe uses all-purpose flour. I re-made the same recipe each time, simply changing out the flour for each batch you see below. These control cupcakes were soft yet sturdy with a slightly open crumb. They weren’t super tall and had some cracking on top that I think visually reflects the slight chewiness they had. Basic yet delicious. I used the same amount of Sofasilk Cake Flour in place of the all-purpose flour in this batch. 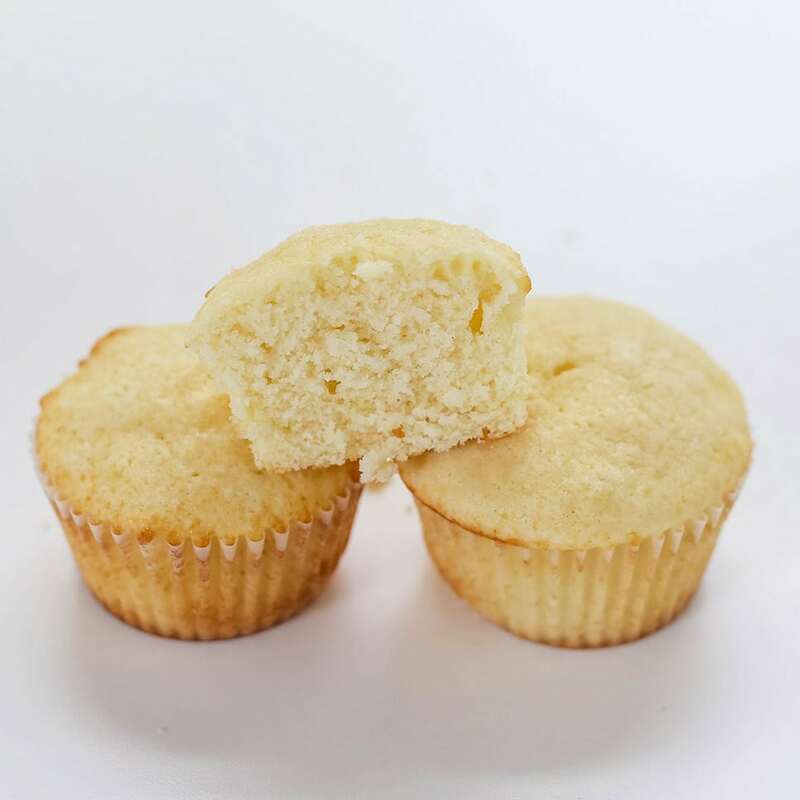 These cupcakes baked up pale and tall with a spongier and softer texture. The softness actually reminded me slightly of a more commercially produced cupcake but not necessarily in a negative way. They were so soft that I don’t think they’d hold up to a heavy or generous frosting or filling. Then I sifted this flour + cornstarch mixture 5 times with a fine mesh strainer. These cupcakes looked more like the control / all-purpose flour cupcakes than the cake flour cupcakes which I thought was interesting. They definitely had a softer, more tender texture than the control batch however, and a finer more delicate crumb. However, they weren’t as soft and delicate as the real cake flour batch. I think visually this comparison does a good job of proving the belief I’ve always held that nothing is quite as good as the real thing. 90% of substitutions you make in baking will alter the taste and texture of the final result. Sometimes substitutions are necessary and I understand that. However, I think it’s always best to follow the recipe exactly as it’s written… at least the very first time you make it so you understand how it’s supposed to turn out. Luckily, since cake flour is refined and bleached it will keep in your pantry for a long time. So why not have some on hand for those few recipes that use it so you can really take your baking to that next level? In the bowl of an electric mixer, beat the sugar and butter until light and fluffy, about 3 minutes. Add the egg and vanilla and beat until combined. Add the dry ingredients and milk alternatively, starting and ending with the flour, beating well after each addition. Continue beating for one minute. 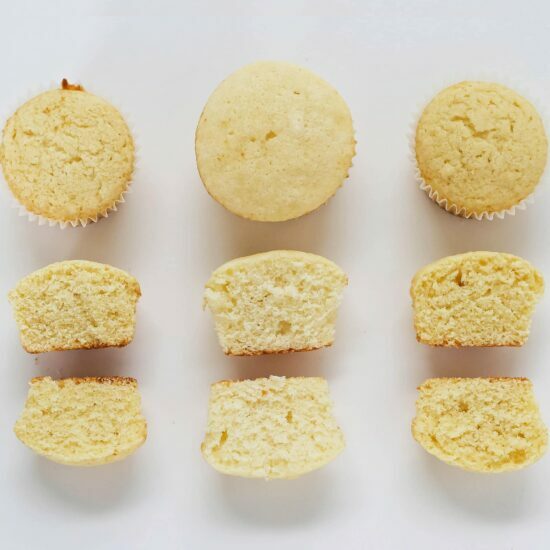 Divide the batter between the cupcake cups, filling each about 2/3 full. Bake at 350°F for 20 minutes, or until a toothpick inserted comes out clean. Let cool for 10 minutes before removing to a wire rack to cool completely. Have you done any experiments with bleached flour vs unbleached flour? I always use pastry flour for anything that doesn’t have yeast. Fortunately there is a co-op near me where I can buy 25 lb. bags. What about mixing AP with Cake Flour….? Will we get the best of both worlds? This is bad news as we don’t have cake flour in Germany and I HAVE to substitute. And is that correct that cake flour has less gluten??? Oh no, Jenny! Can you order it online? Cake flour has less protein, so it will form less gluten when mixed in a batter. 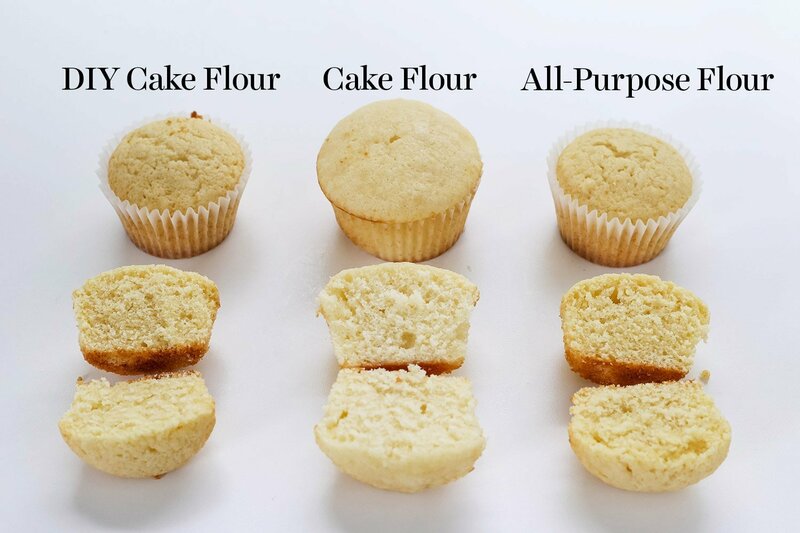 The differences between cake and AP flour are quite astounding! I’m working with King Arthur cake flour these days, and I like it very much. Have you played with it at all? No I haven’t because it’s unbleached, so it literally won’t work for some recipes like angel food cake. I’m so glad that you’re bringing back the experimental posts! This entire page was super interesting to read and I love that you took side by side pictures! Thank u! I never realized how much of a difference there is between store-bought cake flour and DIY cake flour. I’m so glad you like these posts, Dalya! Thanks! I love these comparisons, and learn a lot from reading them. I’m curious if the results would be the same if you used a recipe that calls for cake flour as opposed to AP flour as the basis for the comparison. i live in australia and i dont think the measuring cup and table/teaspoon is the same in America. do you think you will be able to show any grams in table and teaspoon next time you publsih a recipe? Hi! Did you see grams are included for the dry cup measurements already? Most scales built for home use aren’t accurate enough to decipher small amounts of weight such as tablespoons and teaspoons so I don’t use weight for those measurements. Well. That was kind of sad and interesting. Our self rising flour I think it’s more like the cake flour in the US. Yep, you can calculate the protein content by looking at the nutritional label… or avoid the math and just Google it 😉 It does take some trial and error to get a sense for what work work best and when. Maybe I’m missing something, but I’m confused. 1. The heading at the bottom of the page says “how to make cake flour 101” and is followed by a recipe for cupcakes using all-purpose flour. Shouldn’t the heading be something like “recipe for test cupcakes”? the actual “how to make cake DIY cake flour” was in the text above. 2. and am I correct in understanding that to make this recipe with cake flour, you replace only 1-1/2 c all-purpose flour with 1-1/2 c cake flour? you leave in the baking powder because we’re not talking about self-rising flour, that’s a different topic, right? 3. you showed the 3 different results but don’t really “announce” a definitive winner, as it depends what kind of texture is desired, correct? if you are using lots of buttercream frosting, as you said, you would *not* want to use cake flour because the cupcakes would be too soft. so you showed the different results so the reader can choose which texture/traits they prefer, correct? 4. did you consider using 1/2 cake flour and 1/2 all-purpose flour? so they would be a little softer but still strong enough for filling or frosting? thanks! I love this whole concept of side-by-side, visual comparisons, it’s super useful and I don’t think I’ve seen this anywhere else. I think you’ve answered most of your own questions! The heading at the recipe is automatically generated so it’s something my web designer will have to hand code to make it clearer. Yes, correct to point #2. Correct to point #3. For point #4, yes half and half would be a good balance depending on what you’re looking for. I would like to see the comparisons of bleached and unbleached flour. I have always dreamed of going to culinary school, so the baking nerd inside me absolutely “geeks” out every time you post a side by side comparison. I truly had no idea there was a difference between bleached and unbleached flour and have always bought unbleached when available. Also crazy interesting to know DIY cake flour is not the same, I felt the same way when I learned this about DIY buttermilk, as I had almost exclusively been making my own instead of throwing away 3/4 of a bottle every time I want cornbread or red velvet cupcakes. Thank you for taking the time to do these experiments and share with us! I would like to see comparisons using bleached an unbleached flours. When baking cookies, I use unbleached flour. Also, thank you for this article using cake flour. The next time I bake cupcakes, I will use it. I would like to see comparisons using bleached an unbleached flours. Could you do a test comparing cake flour and sponge flour please? Thanks. I love this experiment! Helped me a lot. I am opening my own bakery and I used to bake using cake mixes, but now I am going all made-from-scratch, so I have been doing a lot of experimenting- it is a learning curve, but well worth it! Keep doing your experiments we both love the information!!! We (we both love to bake) find your information both insightful and accurate. One of our favorite recipe is making Banana Bread (we live on the Big Island of Hawaii) and since we use whole apple-bananas the bread tends to come out with uneven texture. Now we are going to try both the DIY and the real cake flour to see if it makes it better. BTW we found freezing the banana pulp for a few days improves the flavor and evens out the moisture content problem. It also helps to freeze carrots for carrot cake. Try that for an experiment, you and your readers will be shocked at the results !